The Saint Jude Men’s Club is for all men of our parish and promotes fellowship through social interactions and also supports the parish through philanthropic fundraising events throughout the year. Funds raised are used for parish projects. 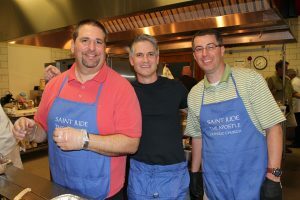 In the past the Men’s Club has helped with renovations in the Stapleton Center Kitchen, parish landscaping projects, contributions towards the church renovation, ministry hall portable stage and furniture for the youth room. If you are not receiving the Men’s Club emails, please contact us to be added. For more information on any of our events, contact the Men’s Club.